the same old New Year's resolutions. Every year at around this time, millions of people around the world resolve to improve their lives beginning Jan. 1 – and for most, their resolutions die sometime within the first few months, if they get off the ground at all. What can you do to make 2017 different? 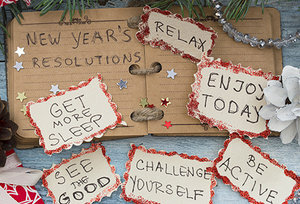 What can you do to make sure your New Year's resolutions stick? Here are five ways to keep your 2017 resolutions while avoiding some of the common pitfalls that have struck down your resolutions in years past. 1. Think It Through: One of the biggest mistakes resolvers make is jumping into a resolution without thinking it through. Sure, you can resolve to start working out, lose weight, quit smoking, eat healthier or be more patient with your kids – but words are just words unless they're supported by sensible actions. And sensible actions require a sensible plan. Resolving to exercise? Think about how many days per week, whether to go to the gym or work out home, potential hurdles / challenges that may come up, and other factors. Resolving to be more patient? Map out a half-dozen specific ways to do it (think before you speak / act; give yourself a "time out" so you can refocus, etc.). Whatever your resolution, you have to figure out how to make it work or it probably won't work, pure and simple. 2. Recruit Help: While everyone has their own New Year's resolutions, that doesn't mean you have to go it alone. Your friends, family, co-workers and other acquaintances are your biggest allies, and chances are they've either resolved to do one of the same things you have, or they did it last year. Work out with a friend; brainstorm healthy meals your kids can help prepare; and engage online support groups whenever possible. Tap into their experience, their encouragement and their support to stay focused and strong throughout the year, and your resolution won't be the one-week, one-month or even one-year variety; it will last a lifetime. 3. Remember Last Year: Those who refuse to learn from the past are condemned to repeat it, and we're guessing that like most people, last year's New Year's resolutions didn't go so well. In fact, this year's list might be identical to your 2016 list, your 2011 list, and so on. What will make 2017 different? A good start is to learn from your mistakes so you can chart a more effective course. If you've had trouble getting to the gym consistently, despite your best intentions, perhaps this time, you need to refine your schedule, research an at-home program for the days you can't get away, or work out before work instead of after, when you're usually tired. Succeed in 2017 by remembering why your 2016 resolutions didn't pan out. 4. Take Small Steps: In many ways, New Year's resolutions have taken on a black-and-white quality; either you're not resolving to do anything or you're resolving to do big things, instantly. Unfortunately, life isn't that simple, and the overwhelming majority of resolutions involve behaviors / patterns that are difficult to change overnight. The problem with this all-or-nothing mentality, of course, is twofold: It sets us up for failure at the first sign of a challenge ("I resolved to work out three days a week, every w eek, and already I've missed a few days!") and it ignores the small steps that are just as, if not more important in accomplishing the big step. Want to quit smoking after 30 years? You may want to resolve to scale back progressively, rather than quit cold turkey. Want to start exercising (for essentially the first time)? Try 1-2 days a week of brisk walking for a few months, or a few step classes at the gym, and build from there. 5. Dream Big: Despite the fact that generally, resolutions have a greater chance of success if they're accomplished in small, manageable steps, that doesn't mean you need to think small. New Year's resolutions represent the perfect opportunity to reach for a better world, a better life, a better you; so dream big and go for the proverbial gold. After all, if you set your sights too small, you might be more likely to quit (or not even start) because you don't consider it meaningful enough. Craft a sound strategy to achieve something big that will make you proud. Get help when you need it, take it slow, and most of all, don't get frustrated when that little thing called life temporarily gets in the way. Now that's the smart way to make – and keep – your New Year's resolutions. It's week one of 2015, which generally brings high hopes when it comes to improving your health and wellness. Worldwide, millions upon millions join gyms, swear off soda and processed foods, and commit to making this the year they turn things around. But by February, many have already abandoned their goals, and with each passing month, more follow. Move beyond the moment: Step 1 is getting beyond the "time to turn my life around this year" moment and dedicating yourself to the effort it takes to complete any resolution. After all, it wouldn't be on your list year after year if it were easy, right? This is a 365-day process that will have its ups and downs (see step 2), and the quicker you realize that – and still believe you can succeed – the better. Take a few steps back: OK, so ideally, your 2015 will be smooth sailing and you'll achieve all your goals. But as step 1 pointed out, if it were that easy, your resolution list would be blank – yet here we are again, resolving to lose weight, exercise more, etc. Taking a step back means two things in this context: remembering your past (why you're still not where you want to be) and not being afraid if everything doesn't go right this time. Note that this doesn't mean you accept failure; it means you embrace this difficult process with perspective. The No. 1 reason people fail – in just about anything – is because they give up the first time something "goes wrong." Master the selfie: Whether it's done with your cellphone or mental snapshots, become a master of the selfie, tracking the person you were and the person you're becoming, day by day. If it's weight loss you're after, snap a photo every time you see a difference. Looking to stress less? Take plenty of selfies of you enjoying life more – while on that vacation you vowed to finally take, spending a lazy spring day with your family (that never would have happened in 2014, 2013, etc. ), or just relaxing in your own backyard on a much-needed day off. Write your 2016 resolutions now: Want to maximize the chances you'll polish off your 2015 resolutions? 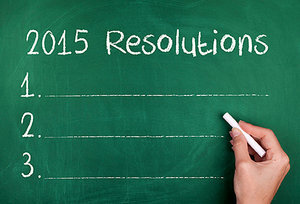 Write your 2016 resolutions today – and don't mention any of your 2015 resolutions. After all, why write down resolutions that won't be needed anymore? In fact, go one step further by crafting 2016 resolutions based on the person you'll be after completing your 2015 resolutions. If you're losing weight in 2015, resolve to take a vacation to a beach destination in 2016 – and wear that bathing suit you know you'll fit into by then. Trying to eat better in 2015? Then put "Make more healthy meals from scratch" on your 2016 list, after you've learned how to eat right this year. Resolutions can motivate and empower, or they can just remind you of what you couldn't accomplish year after year. In 2015, rely on the past, the present and the future to ensure 2015 – and the year after that, and the year after that – gives you a great big reason to smile.